FYI, on Dec. 13, 2018, I discovered that "Babylon 5" is airing at 12:00 PM ET on Comet WPNTDT3, 22.3, Pittsburgh, PA. Dec. 13 ep. was S4E6 "Into the Fire." Has There Been Any News Re. The New B5 ~2016+~ Theatrical Movie? Re: Has There Been Any News Re. The New B5 ~2016+~ Theatrical Movie? Any NEW news re. B5 projects from JMS at the 2015 SDCC (if that's happened yet.)? I'm on Twitter many times every day, but I'm almost never on Facebook. @B2Bspecialist @pinojo @straczynski Keep an eye on things at http://t.co/GLNyNSDJfD . I gave up on anything new & good in B5 universe. 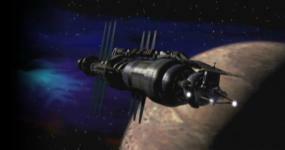 Babylon 5 having been made well enough the first time. Mini update to B5Scrolls. For anyone who might have missed this. Re: Mini update to B5Scrolls. For anyone who might have missed this. Speaking of which, I liked the shimmering effect used on the Drakh emissary in S4E11 "Lines of Communication." Good ol' N'Grath, met a sad end, off camera. B5 CCG... Anyone still playing this? Re: B5 CCG... Anyone still playing this? Never did get into playing the the B5 CCG (or any CCG). Had quite a few B5 CCG cards, but sold them years ago. Oops, I thought you were in-the-know on all things Dresden. IS THERE A #3 ??? I didn't see it on Amazon. Regarding the chess position, they undoubtedly don't think that anybody would pause the video to examine it. I used to play and I didn't bother. It was just background. Figure, less than a week after saying that I've never met a girl/woman who likes The Three Stooges, I meet one. Her favorite is Shemp. FWIW, I've never met a girl/woman who liked The Three Stooges. Must be a guy thing. Nyuk, nyuk, nyuk. I'll be in the car, asleep. Wake me in 2016. I'm watching Haven on DVD via Netflix. Currently on Season 2 Disc 4 (which must be all extras.). My favorite B5 movies were "In the Beginning" and "A Call to Arms" (which served as a fine lead in to a worthy spin off show.). If only TNT-Atlanta hadn't been such a massive collection of assholes. Thirdspace is one of those movies where the more times I watch it, the less I like it, and I never did actually like it. I'd take The River of Souls over Thirdspace. True, that should help him get back in, but if he wants to change his handle from Republibot 3.0 to Kevin Long, that'll probably take an Admin. or AntonyF. It'd be called "Babylon 5: __________________________" to indicate that the setting is that of the "Babylon 5" universe. We'll be damned lucky to get ONE two-hour movie. YES to Crusade and the Technomages! BTW, the ONLY B5 movies that I really disliked were the Rangers pilot, and Babylon 5 - The Lost Tales - Voices in the Dark "Over Here". I liked "Over There". I wouldn't. I'd reboot Crusade. JMS at SDCC - B5 News?!? Re: JMS at SDCC - B5 News?!? I'm not holding my breath. It's been 3:15 hours since his talk was supposed to start. Maybe it'll be "The Telepath War" told and "Crusade" continued in comics. Just kidding. I could never have something even that good. :( I think I downloaded it, 90% sure. Have to check the laptop PC.